We don’t normally shout out loud about environmental issues on Daily Bits, but an article that I read some time back on the BBC has got me thinking. The article is titled “What should be done about plastic bags?” and the numbers presented are rather surprising. We seem to have this idea that plastic bags are bad, and the reusable bag movement has become so big that more and more supermarkets have totally done away with plastics. But is it really justified? Does doing away with plastic bags really make a huge positive impact on the environment? 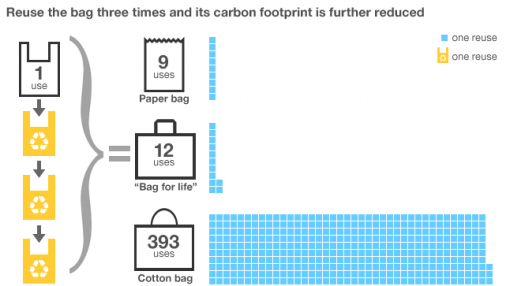 That is what the BBC article talks about, and at the end of the day, the surprising result is that one has to keep using those reusable bags hundreds of times in order to beat plastic bags (carbon footprint-wise). I highly recommend the article for practical reading. Moving on, I am assuming that you guys are all tech savvy, and that hopefully, you are also leaning towards making your own little contributions to the environmental cause. After all, we are all inhabitants of this planet, and saving it can only benefit ourselves. Aside from that “little” issue about plastic bags and reusable bags, is there anything that can be applied to our technology-infused life? One thing popped to mind immediately: online shopping. However, considering logistics mainly, online stores may have a big plus. With the use of technology such as retail POS software, these virtual stores not only offer convenience, but they also help cut down on energy consumption (among other things) as opposed to brick and mortar stores. These are only some of the things that I can think of that we (tech savvy or not, actually) can do to show environmental awareness. What about you? What are those little things that are part of your routine?